linking food growing to nutrition and “5 a day”. Mrs Nugent visited the school garden occasionally during the summer holidays and it quickly became overgrown. A timetable or rota for holiday care would be useful. 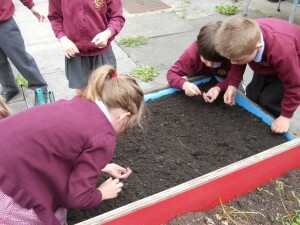 Other teachers rarely got involved in the garden meaning one person was responsible for care, maintenance and pupil participation in the school growing areas. Weeding was sometimes irregular meaning that sessions were spent weeding instead of planting. The Trust went into the school twice a week to work with Mrs. Nugent and a group of children. By the end of the project, we had worked with Year 1, 3, 4 and 5. 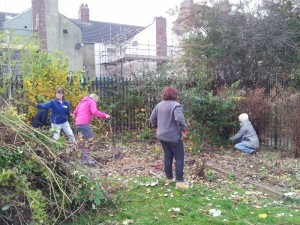 Volunteers from the church got involved to help clear some of the larger areas that the children could not work on. Over the past 12 months, the school garden has completely transformed into a useable space with lots of fruit and vegetables growing. Trust staff have given guidance on how to get pupils involved in the future. All of the children involved now have a sense of where their food comes with sessions focused on the origins of our food. We have been working with the Assistant Head Mrs. Coverdale and the Caretaker Mr. Morgan, who organised a group of 6 children to take part in the growing activities each week. linking Food growing to nutrition. It is very large school, so can be difficult to get all of the children involved. There is lots of growing space at this school; however it is not always used by teachers as an extension to the classroom despite year groups having allocated areas. Being a large school we had as many children involved as possible, so they could pass on their knowledge to others in class. 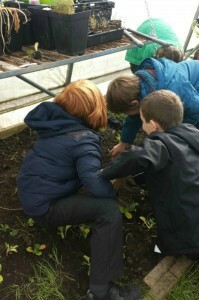 Over the period of a year, with the children, the trust had managed; maintained and harvested vegetables in 6 raised beds and assisted the caretaker in planting up the school polytunnel. Fruit and vegetables grown in school were used in school dinners, so children could have a direct link from ground to plate. 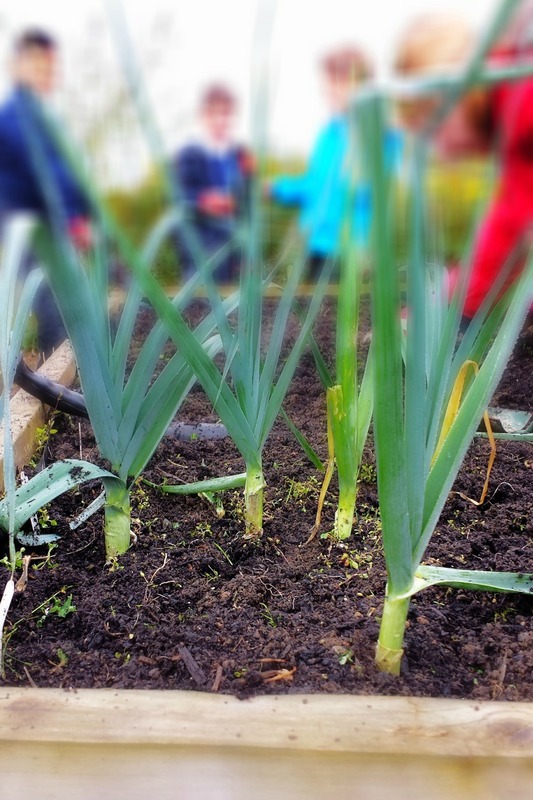 The growing areas of this school are continuously successful because they have support from the caretaker, this has meant that during the school holidays, crops are looked after and that at times of staff changes Mr. Morgan has been able to assist with continuing growing in school. The school achieved their Eco schools Award – Green Flag and also received an award from Northumbria in Bloom, both who noted the work the Wildlife Trust had done. Initially the Trust worked with an enthusiastic Nursery teacher Miss Beaumont, supporting the gardening club and gardening projects at the school. Working with volunteers to maintain the school garden. Only some teachers were using the garden and linking it to classroom work. Maintenance- during dry times in the summer some plants were not watered regularly enough. A rota for watering and weeding is needed. The teacher we had initial contact with left the school and another less confident teacher took over. This school has a fantastic volunteer parent that works in their school garden every Friday and helps to organize their gardening club! This has ensured the continuation of the work the Trust started with the school after the project finished. 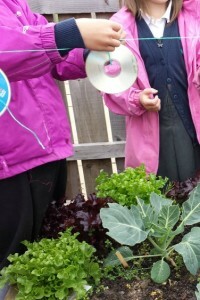 The year 5 pupils created a Kitchen Garden and won an iPad when they entered the creative containers competition as they had chosen to grow their food in kitchen utensils. The school recycled over 600 plastic bottles to create a greenhouse. The Trust worked with Nursery, year 4 and yea r6 children to create an herb path for the cook to use in school meals. The Trust worked with the gardening club and a group of 7 parents to completely clear an over grown growing area and plant it up with lots of tasty fruit. 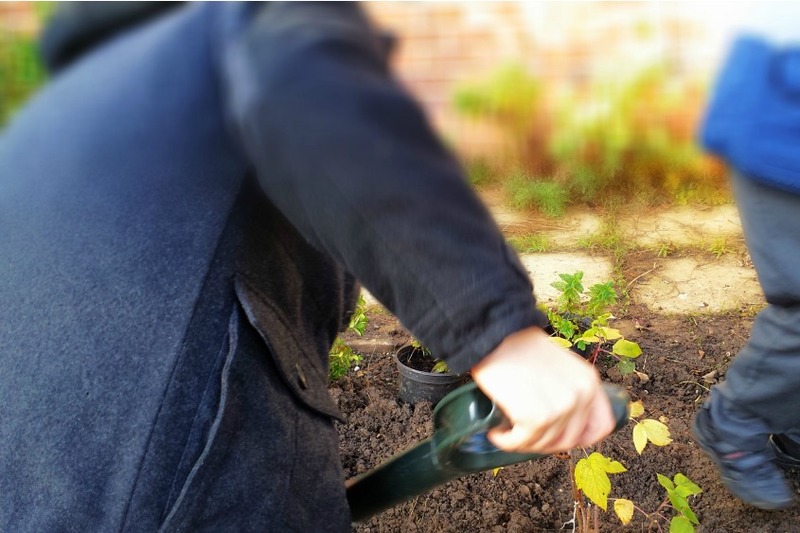 Support of the Trust meant that the new teacher looking after the garden, Mrs Underwood could begin doing gardening sessions and build up her confidence. The school achieved their Green Flag in the Eco Schools Award. delivering after school clubs linked to Grow and Cook. 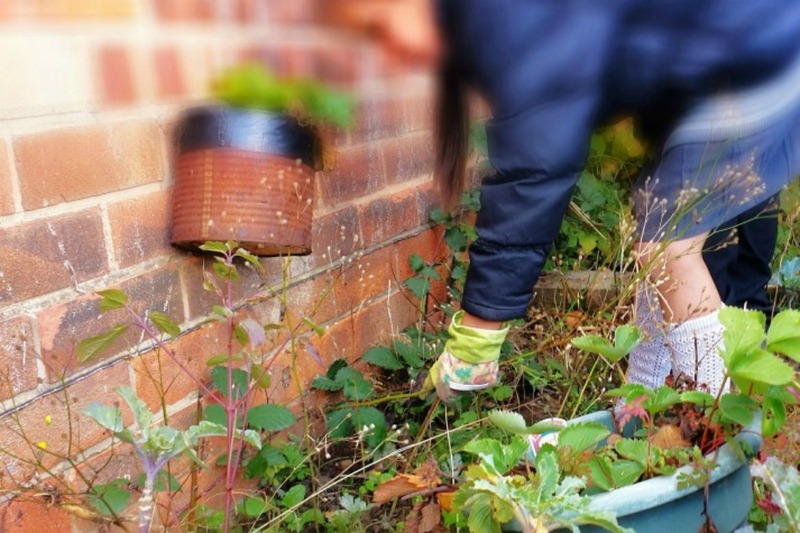 Maintenance of the plot – working with children mean that you can only do a small amount of weeding – a mechanism is needed for regular weeding and watering. The activity very much relied on a small number of keen staff and if their priority is changed the activity suffered. In 2012-13 over 8 days we worked with the whole school in small groups doing garden maintenance, planting and weeding and harvesting vegetables this was at the Key Stage 1 quad and in the Key stage 2 garden. We also worked with the Kitchen Garden Club after school club to look after the allotment harvest and cook lots of delicious food with it. 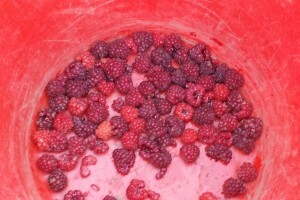 The school made excellent use of blogs to show what was happening in the garden. The school has bought into Tees Valley Wildlife Trust Growing Wild program. “…this was a brilliant idea and really helpful. Having an expert come in and help and work with the children. Support when needed. The Wildlife Trust is able to get the required resources for us so staff not having to worry about buying incorrect resources.